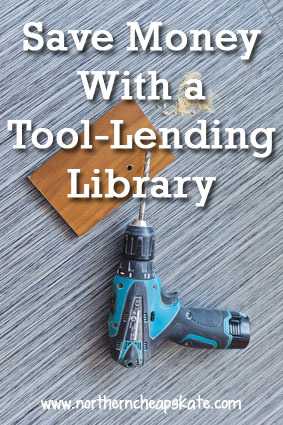 Before you rush out to the hardware store to buy just the right tool for your home improvement project, check to see if you can take advantage of a tool-lending library. A tool-lending library allows you to borrow tools for a period of a day or two all the way up to a week at no cost to you. Find a local tool-lending library and you can save a little bit of money on your next DIY project. No tool-lending library in your area? See if you can borrow the tools you need from family or friends living in your area. See if you can pick up an old tool from Freecycle or put the word out on Craigslist. You could also check local thrift shops for basic tools, or consider renting a specialty tool you only need for one particular project. Borrowing tools (or finding them for free or at a great discount) is a good way to get a “one-and-done” project completed without a big outlay of cash. Just remember to take good care of any tools you use and remember to return the favor when asked. Another option if you’re in a pinch or can’t borrow what you need: Our locally owned, mom and pop hardware store has a great selection of tools that you can rent for a very reasonable price. Everything from shovels to tile cutters to small backhoes. Last year, we rented a lawn roller for $7 – much better than the $100 price tag if you were to buy one. Great idea! I once rented an insulation blower to add insulation to my attic. Worth every penny – and you’ll be guaranteed to get the job done on time because you don’t want to pay for an extra day! Tool lending libraries are savers! We bought a big fixer upper house and we’re able to save money because of them. We just had a deposit during the time we used their services and that was it, definitely something to look for in your area.